PURPOSE: Use this document as a reference for creating and maintaining individual Person Profile information (i.e. Degrees, Certifications, Languages, etc.) in ctcLink. Modifying a Person to verify. There are multiple areas to update in Profile Management, for this example we will focus on Education. 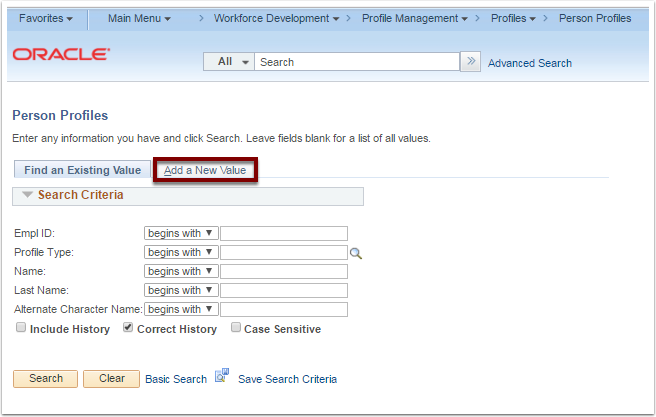 Person Profiles are created in the Workforce Development module. 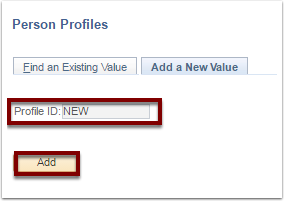 Click the Add New Value tab, (the Profile ID will default to NEW). Enter or Select the Empl ID from the lookup option. Select a Profile Type from the lookup option. The Profile Status will default to Active, change if needed. The Description will default to the individual's name, leave as is. NOTE: Leave the Profile Actions field as is. Select the tab for the Content Type entry (i.e. Competencies, Education, Qualifications, etc.) For this example we will select Education. The Effective Date defualts today's date, change if needed. 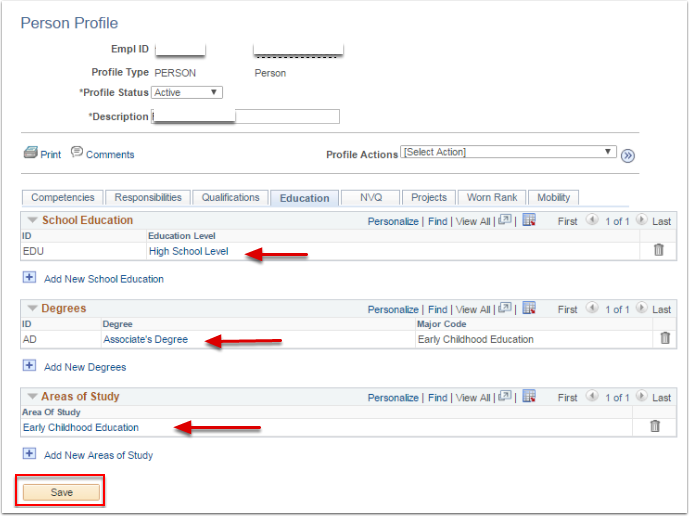 Select the Education Level from the lookup option. The Status defaults to Active, leave as is. Enter the name of the school in the School Description field. 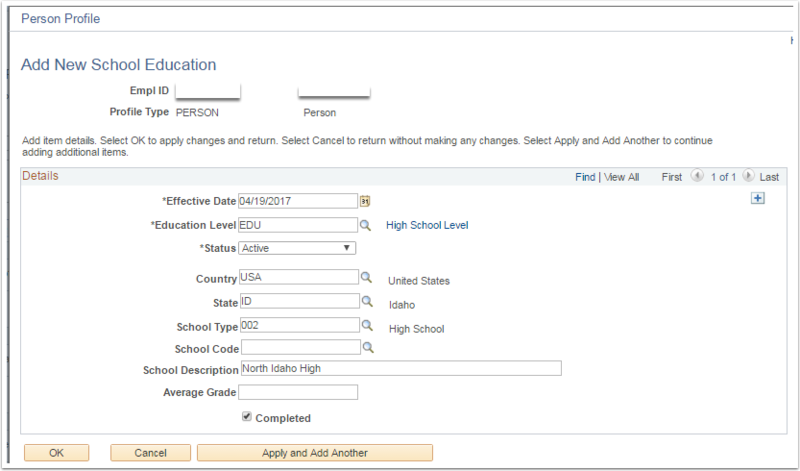 Click the Completed box, if the person completed this Education Level (for this example, if the person did not graduate from HS leave the box unchecked). NOTE: To add multiple Education Levels, Click the Apply and Add Another button. In the Degrees section, click the Add New Degrees hyperlink. The Date Aquired will defualt today's date, change if needed. The Status will default to Active, leave as is. Enter the name of the school in the Major Description field. The Graduated box will be checked, leave as is (for this example, if the person did not graduate or obtain a post HS Degree, uncheck the box). Check the Terminal Degree for Discipline indicator box, if applicable. Enter any notes or comments in the Educator box (this is a free text box). 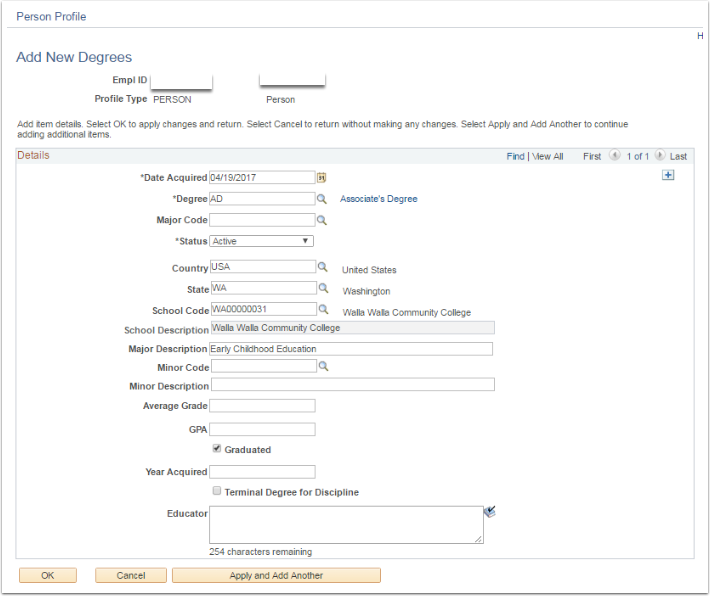 NOTE: To add multiple Degrees, Click the Apply and Add Another button. Enter the Area of Study. NOTE: To add multiple Areas of Study, click the Apply and Add Another button. Notice all sections are now filled with the information assigned. Congratulations you have successfully created Education Information into a Person Profile!! !